Heat wok over medium-high heat, add oil; swirl to coat. Sauté onion for 5 minutes until tender, stirring frequently. Stir in spices and cook everything for 30 seconds, stirring constantly. Add chickpeas, tomatoes and spinach. Cook 2 minutes or until spinach wilts, stirring occasionally. Serve on top of your favourite grain (rice, quinoa, pasta, etc) top with fresh cilantro and Enjoy! Note: If you are making this dish for kids make sure to serve chickpeas and the grain separately. Unlike adults, kids don’t like their food all mixed up so keep it simple. 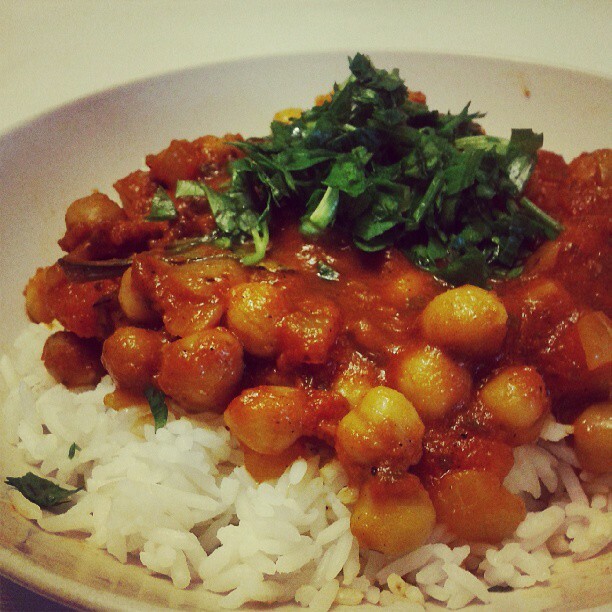 My kids loved the chickpeas!